If you love everything about surfing, this event is for you! Get a front-row seat along the gorgeous beach in Nags Head as you watch some of the best surfers in the nation compete in the multi-day ESA Mid-Atlantic Regional Championships. Cheer on your favorite surfers, discover some incredible talent and soak up the glistening sun. Several tents and an announcer booth will be set up on the beach so you can keep up with what is going on in the competition and purchase some rad ESA merchandise. If you’re lucky, you may even win a prize from one of the ESA’s many sponsors! Last year, over 200 amateur surfers competed in the 2018 Mid-Atlantic Regionals. The Mid-Atlantic Regional Championship is the second of three qualifying events for the ESA National Championship, also known as The Easterns®, which will be held September 15 – September 21, 2019 at the same location. Those competing in the regional competitions have already competed on a local level and were top finishers in their districts. The first event in the regional series is the Southeast Regionals in Melbourne Beach, FL 4/26/19 – 4/28/19. The final event will be the Northeast Regionals in Belmar, NJ 5/17/19 to 5/19/19. Official rules, age division break down and eligibility information found here. If you cannot make it to the event, visit http://www.surfesa.org to watch a live stream or check updates. ESA, or the Eastern Surfing Association, is the largest amateur surfing association in the world. Founded in 1967 by a group of surfers, its mission statement is to “promote, preserve, and protect the sport of surfing on the East Coast.” The ESA prides itself on family-oriented programs that encourage healthy, active lifestyles. Activities hosted by the association are organized into 24 districts that extend over 2,000 miles of coastline along the Eastern seaboard from Maine to Florida, and even along the Great Lakes. Professional surfers like Kelly Slater (eleven-time world champion) and Lisa Anderson (former world champion) both got their start through the ESA. Nags Head is a wonderful town to visit with premier dining establishments like Miller’s Waterfront Restaurant and Sam & Omie’s as well as shopping centers like the Tanger Outlets. Nags Head is also home to fun recreational and historic activities including Jockey’s Ridge State Park (the tallest natural sand dune in the United States), the Bodie Island Lighthouse, and of course, Jennette’s Pier. 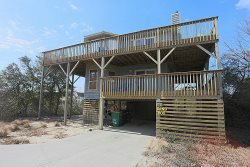 If you’re coming out for the event, make sure to check out one of our Nags Head Vacation Rentals. Some of our houses are even within walking distance to Jennette’s Pier so you can get a great spot to watch the competition! Cost: There is no charge for spectators on the public beach. To view from the pier, walk-ons cost $2 for adults and $1 for children 12 and under). For more information, visit http://www.surfesa.org/competition/midatlantic/.